What do you do with all that leftover stuffing or dressing after the big meal? You turn them into a delicious appetizer for the weekend. 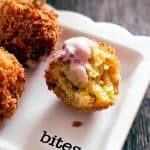 These Deep Fried Cornbread Dressing Balls with Cranberry Dip are perfect for Sunday afternoon snacking! Combine the cornbread dressing and the cheese. Scoop into 1.5 inch balls and roll in you hands to make them smooth. Combine flour, poultry seasoning, salt, and pepper in a small bowl. Beat eggs and milk together in a second bowl. Add the Panko crumbs in a third bowl. Dredge each ball through the flour mixture and shake off any excess. Transfer each dressing ball to the egg mixture and evenly coat. Roll each ball in the Panko crumbs until evenly coated. Set each stuffing ball on a plate and allow to sit for a few minutes to allow the coating to stick. Heat oil in a deep-fryer or large saucepan to 375F. Working batches of 4 or 5, carefully place the cornbread dressing balls in the oil and fry until all sides are golden brown. Remove to a paper-towel-lined plate to drain. Continue until all the dressing balls are fried. Keep in a 250F oven to keep warm until serving. Combine equal parts sour cream and leftover cranberry sauce. Serve with the fried cornbread dressing balls.